This set of variations on the Irish tune “The Gobby-O” is taken from Chicago police officer Francis O'Neill's collection Waifs and Strays of Gaelic Melody, published in 1922. 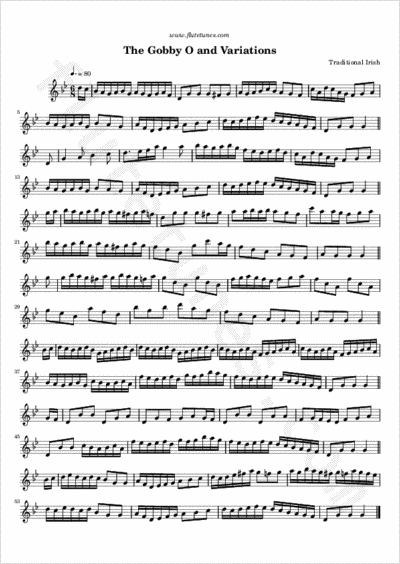 The tune became popular in American fife and drum repertory, especially under the title “Jefferson and Liberty”, the name of a campaign song set to the melody. One suggestion regarding the meaning of the title postulates a progressive derivation from “Gaberlunzie Boy” (i.e. beggar boy), shortened to “Gaby Boy”, and finally morphing into “Gobby-O”. Other sources say that the title refers to a ‘gobby-stick’ (a flute or fife), the inference being that these woodwind instruments are hollow sticks played with the mouth (‘gob’ is the Gaelic word for ‘beak’ or ‘mouth’).